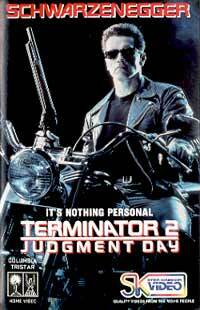 It took about seven years before salivating Terminator fans got their sequel. Since then Cameron made impressive films like Aliens and The Abyss - and a good thing for it, as the liquid digital FX created for the latter became an essential part in the second installment's driving force. Sarah Connor has been taken up in a mental hospital, her ramblings of time travel, an apocalypse and killer robots from the future not gelling well with the authorities. Her boy is now a teenager in foster care. The ruling robot force sends an even more powerful and advanced Terminator back to the present to take care of future resistance leader John Connor - played by a young, whistle-throated Furlong in his (often annoying) big screen debut. But, the resistance manages to reprogramme an old Arnie model and send him back simultaneously to protect John. Great scenes of action, destruction, tension and Arnie charm drive this blockbuster home. Sure, you can argue, why didn't the robots from the future merely send the new jacked-up Terminator to the time the first one was sent, but once you start arguing with a concept that doesn't officially exist in our dimension yet, don't wrack your brains - it's a movie. The movie featured some new digital FX techniques which revolutionized filmmaking. Brad Fiedel's ominous soundtrack is boosted orchestrally from his minimalist, dated '80s synth one in the original. PS. Badboy rockstars of the moment, Guns 'N Roses were roped in to supply the theme song.